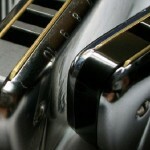 Combs- pearwood vs acrylic vs bamboo – Spiers Custom Harmonicas- custom harps you can depend on! 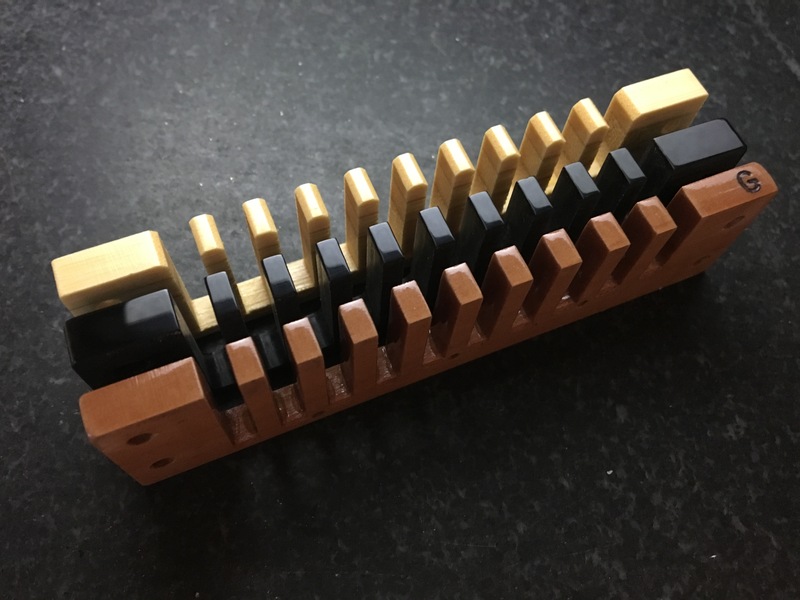 I offer a choice between sealed pearwood and CNC machined black acrylic combs. Each comb functions well, as far as how the harp plays. The pros and cons revolve around tone, aesthetics, and ease of cleaning. The price of my custom harps is the same with either choice. The newest addition is the black acrylic. The face is highly polished, while the rest of the outside perimeter remains as-machined for a smart looking contrast. They are basically identical to the Corian combs I discontinued a few years ago, but much less fragile when dropped. Richard Sleigh and I are having these machined at the same shop, which is local to me. Reasons you might choose this option could include durability over the long haul, very slick face, and ease of maintenance/cleaning. Due to the higher mass of the material, a harp with this comb will often sound somewhat brighter than the same harp with wood or bamboo. My pearwood MB comb has quite a bit of labor in it to make it comfortable and not be prone to swelling. The tines and corners are lightly chamfered, with a broad flat face to retain the maximum surface to seal your embouchure. The channels are heavily sealed with non-toxic polyurethane, and the face has a gloss finish. It’s best not to use alcohol on it as it may dull the finish. This comb is my personal favorite for tonal reasons. Please note how the bamboo Crossover comb has changed in appearance since they were introduced. I have stopped using them. The tines are now heavily beveled, instead of flat-faced like they used to be. The finish is slick but not shiny, however I’ve been told it’s actually a more protective sealant than before. Some players have trouble with accurate single notes, with that profile, while others prefer it. It’s too bad because it was a very nice comb before the changes.